A seemingly dry, technical paper from 1937 in the Telecommunications Journal of Australia offers much broader interest following the popularity of the 2010 film ?The King?s Speech?. 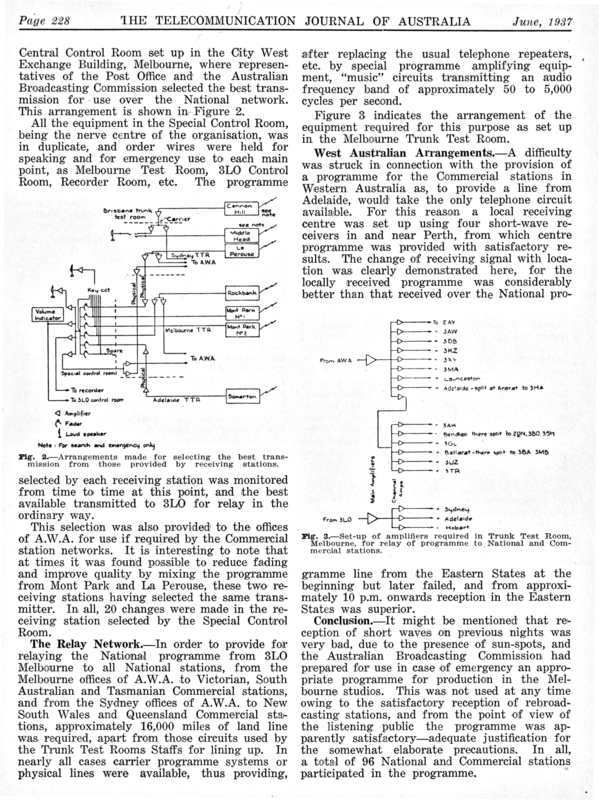 The June 1937 paper by A.H. Kaye describes the engineering networking arrangements set up by the Australian Postmaster General?s Department to transmit across Australia the BBC?s audio commentary on King George VI?s coronation to all Australian national and commercial radio stations. The six hour broadcast included the now famous speech by the newly crowned King to his British Commonwealth. Today, international telecommunications and Internet broadcasting, to and from Australia, are taken for granted. Not so long ago, overseas broadcasts to Australia were bound by the vagaries of HF propagation. Our historical paper for this issue (Kaye 1937) is taken from Volume 1, Number 5 of the Telecommunications Journal of Australia (TJA), dated June 1937. 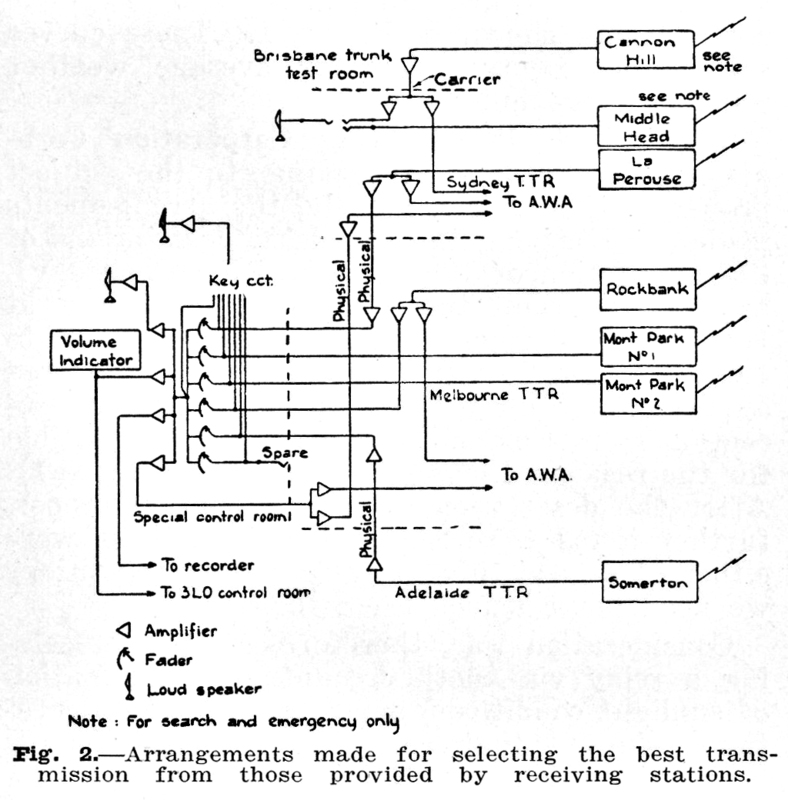 It describes the extensive telecommunications engineering required to bring the King George VI coronation broadcast to Australians, on 12 May 1937. This apparently dry and technical paper is fascinating today seen through fresh eyes, given the popularity of the film ?The King?s Speech?, starring Geoffrey Rush and Colin Firth (Wikipedia 2014). The TJA paper was written by A H Kaye, who went on to present the Australian Faraday lecture in 1972. Mr Kaye also produced a booklet for the Postmaster-General's Department (PMG) entitled ?Telecommunications in Australia: a short history of telecommunications?, based on his Faraday lecture. 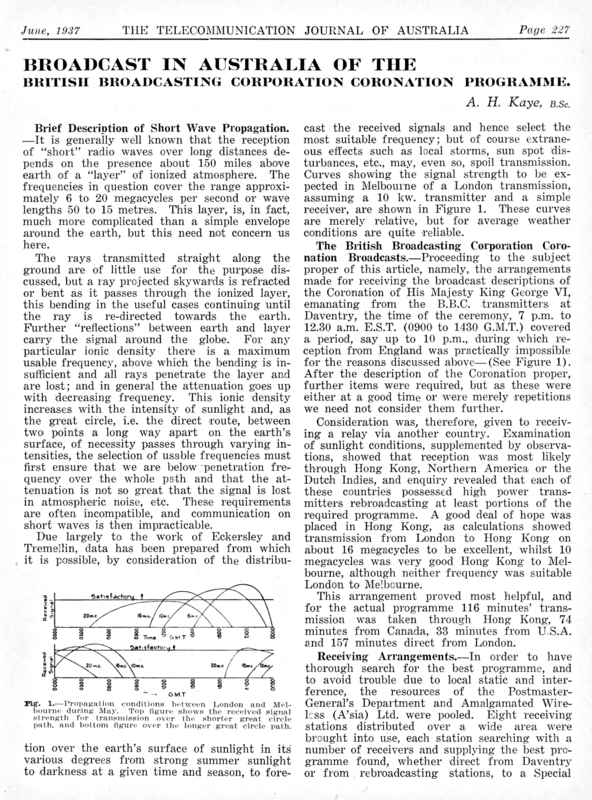 The 1937 paper provides a brief introduction to High Frequency (HF) propagation, which may not be well known to our younger readers. 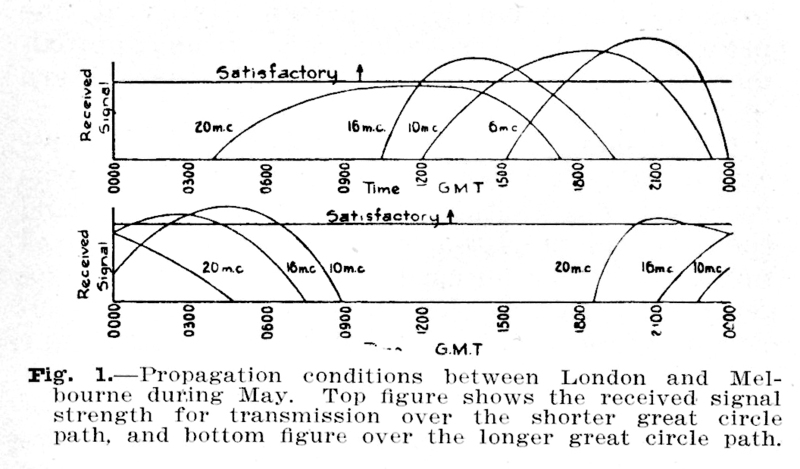 It discusses the challenges of a 9 a.m. (Greenwich Mean Time) broadcast in the United Kingdom being received by HF stations in Australia, given the ionosphere does not reflect HF signals unless bathed in sunlight. 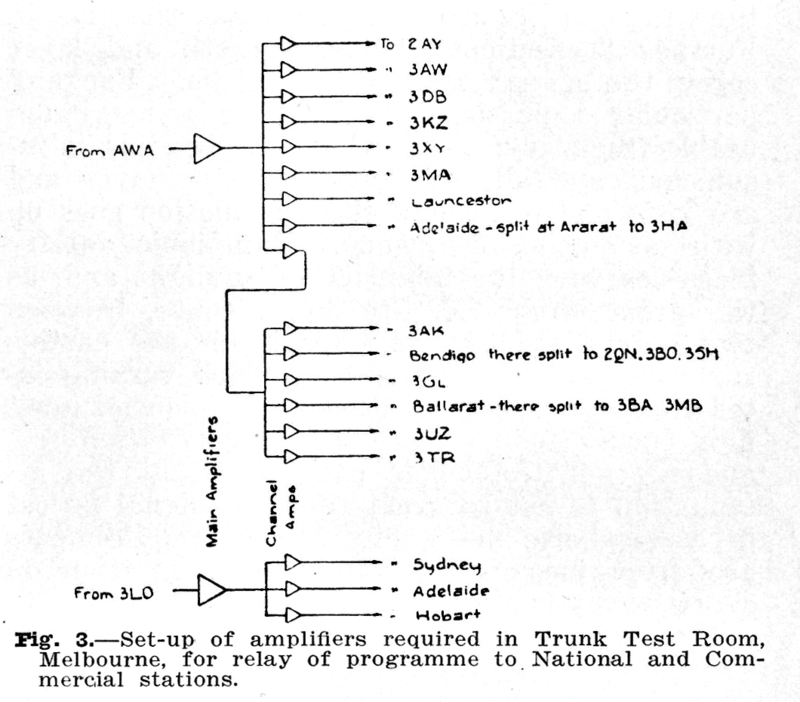 The PMG engineers determined that the broadcast could be relayed by several powerful stations re-transmitting from Hong Kong and North America, provided they selected the optimal propagation frequencies and utilised diversity reception in Australia to compensate for HF propagation fading. There was close co-operation between the PMG, representing the National Broadcasters, and AWA Ltd. representing the Commercial Broadcasters, to re-transmit the coronation broadcast within Australia. Several interstate HF receiving stations provided diversity reception and the paper details how the programme feeds were switchable between receiving stations to compensate for signal fading. An elaborate configuration of relay feeds was also provided to 96 broadcast stations via the National Broadcasting network and via AWA Ltd to the Commercial Broadcasters. One historic limitation was the single telephone circuit between South Australia and Western Australia, which was not available for the broadcast. The commercial broadcasters were therefore forced to establish alternate receiving stations in WA for an East-West link. Through the work of the personnel involved, the relay held up throughout the King?s Speech and for five hours of related broadcasts. This was considered very lucky given recent sunspot activity had all but ruined HF propagation the day before. Kaye, A.H. 1937. ?Broadcast in Australia of the British Broadcasting Corporation Coronation Programme?, Telecommunications Journal of Australia, June 1937, Vol. 1, No. 5, pp. 227-228.